December 11th-Some one hundred people braved sub-zero temperatures in Hamilton, Ontario on Friday night for a candlelit walk, drawing attention to the urgent need for real action on climate change. Hamiltonians want Canada to commit to real climate action policy during the ongoing Copenhagen negotiations. We want fair, ambitious, and binding targets to reverse our contributions to climate change. 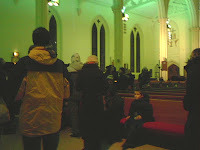 The walk, organized by the Hamilton faction of the 350.org group, stopped off for a warm-up in Christ's Church Cathedral. Local KAIROS members and Hamilton Churches are also part of the campaign to draw attention to dangerous climate change, and on Sunday rang their bells 350 times. Most recently, the Premiers of two of Canada's largest provinces publicly declared their opposition to our Prime Minister's lack of commitment. This is significant because our provinces can be our greatest Lobbyists, and can make many of their own decisions regarding energy and environment and economy. We are with you, even if our Prime Minister is not! The Kairos website reports over 150 churches committed to ringing their bells that day. In Hamilton and area, St James Anglican in Dundas, MacNeill Baptist in Westdale and St Luke’s Anglican in Burlington, Appleby United Church in Burlington, East Plains United Church in Burlington, and Emmanuel United Church on the mountain in Hamilton. The coalition of a dozen local community groups is part of a global movement campaigning for a reduction in atmospheric carbon dioxide levels to 350 parts per million – a level of the greenhouse gas which that leading climate scientists believe will avoid the worst impacts of global climate change. Atmospheric levels are currently at 387 parts per million and rising. There are multiple other ways you can continue to make your voices heard. You can sign the Avaaz petition being delivered on Friday to Prime Minister Harper. Sign the petition, then forward it to everyone you know: http://www.avaaz.org/en/harper_enough_is_enough. You call also phone a Member of Parliament. Call Parliament at 1-866-599-4999 now. Ask to be put through to a member of parliament in your area (or a leading government representative such as Ministers Prentice, Flaherty and Raitt) to demand action to help save Copenhagen. Calling an MP is easy; watch a Sierra Youth Coalition member call Parliament from Copenhagen. Please let us know if you’d like to help with the work of the Hamilton 350 Committee. Just respond to this email. 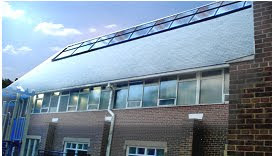 Acutely conscious of the urgent need to address global warming, the Neighbourhood Unitarian Universalist Congregation is making renewable energy its business by installing a 20 kW solar photovoltaic array on the rooftop of its church. The electricity produced will feed into Toronto’s power grid for a generous, long-term price, helping to protect the planet while generating a profit. The public is being offered the opportunity to invest in the solar system by purchasing debentures that will pay five per cent interest annually for 20 years. For more information on the terms and conditions of the debentures, go to www.nuuc.ca/solarpanels.htm. through the negotiations in Copenhagen on a new global climate treaty. How do you build sustainability action amongst members of your faith community? This was the topic of a networking meeting this past November 17th put on by Greening Sacred Spaces at Stanley Street Baptist Church. With four speakers presenting the audience heard much to think about. The evening kicked of with Environment Hamilton's Brenda Johnson who due to her efforts helped a Hamilton school reduce their waste from 94 bags down to 4 per month, explained that getting the janitor in your institution on board ('convincing the custodian') means including him or her in decision making. She also pointed out the importance on getting the kids involved as that sense of 'ownership' is a catalyst for promoting action. Johnson insists that you take small steps; "Pick one thing otherwise you get overwhelmed,"she says. Creating partnerships, pairing up with an event already going on, encouraging groups that rent from the faith community to be part of the greening efforts were other helpful tidbits of advice she offered. Denise Neutel of Meadowlands Christian Reformed Church talked about the need to stay relevant to the community, to keep connected, maintain communication, using websites, list serv and email. Again, the message was to really allow and encourage people to "do their thing," developing, in this way, that sense of commitment necessary to sustain sustainability. Next came a delightful presentation by Chandal Kilgour and Dave da Silva from Cathedral High School's eco team. The team started up when a dynamic teacher addressed the students personally about getting involved with creation protection. There's a buzz going around now and everyone wants to be a part of it. Why? Because it is relevant and meaningful. And it's fun. From putting on a fashion show using recycled clothing to growing herbs,planting a garden and showing eco-films, these activities are speared headed by the students themselves. Jody Van Dorp from Redeemer College wrapped up the evening by talking about the importance of leading by extension, "living it out for them." Being told "you should" is not something that sits well with Dorp nor for most people. Rather, it is modeling why we care that works better for motivating long lasting stewardship. Dorp suggests that we "spread love of God through Nature" by getting people outside more. "This creates love of Nature, " she enthuses. After all, if you don't know it, don't love it, why would you fight to protect it?